Tell the recipient you appreciated his presence at the funeral. Funeral thank-you cards give you a chance to personally acknowledge everyone who helped you or paid their respects at the service. 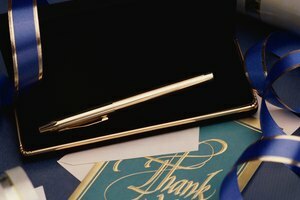 People who are entitled to thank-you notes include the mourners, the person who presided over the service, the pallbearers and people who made memorial donations in honor of the deceased. Even if you use pre-printed cards, it's a nice gesture to personalize the note with a few handwritten words. 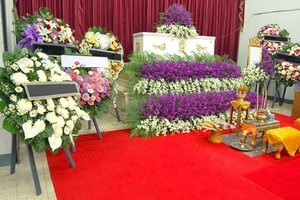 Acknowledge the recipient's presence at the funeral or the viewing. Take note of the fact if he traveled a great distance to attend or if it had been several years since you last saw him. One way you can word it is, "I truly appreciate you and your family taking the time to pay your respects at my father's viewing. It was very thoughtful of you, especially since you had to travel several hours to attend." Say "thank you" for any gifts you received, like flowers, food or pictures that were used for the memorial service. Also show your gratitude for gestures she performed, like serving dessert during the reception or picking up a relative at the airport afterward for you. For example, tell the recipient, "Thank you for the lovely arrangement you sent. Deborah always loved lilies," or "I am so grateful that you acted as a pallbearer at Ryan's funeral. It was a great comfort for me that you were there to support Ryan's brother as he helped lay Ryan to rest." Write about the good times that the recipient spent with the deceased or the special bond they shared. 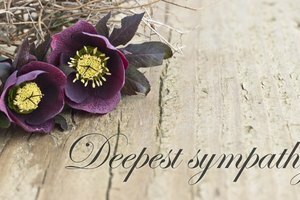 It's comforting to other mourners for the deceased's surviving relatives to acknowledge the relationship they had with their friend who died. You could say, "You've been a tremendous friend to Jake ever since you two met in second grade. Often I've felt like you were my own son because the two of you were so close. I know he would be grateful for how you've looked after me and his father during this time." If the recipient is someone you are fond of that you didn't see much before the funeral, tell him you'd like to see him again once you're back on your feet. Tragedies can act as springboards to bring people closer. Use the thank-you note as an opportunity to nurture the relationship between the two of you. Write something to the effect of, "It was so good to see you again at Mom's funeral. After things have settled down, I would really like to get together with you for lunch so we can catch up." Let someone know if certain words of comfort you helped ease your sadness. 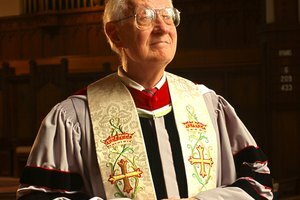 You could tell the priest who held the funeral mass, "The psalms you chose and the sermon you gave really reflected the kind of man my husband was." A family friend who made you laugh by telling your spouse's favorite joke will appreciate hearing that he cheered you up for a moment. Titus, Christa. "Things to Write in Thank You Cards After a Funeral." Synonym, https://classroom.synonym.com/things-to-write-in-thank-you-cards-after-a-funeral-12082813.html. 29 September 2017.